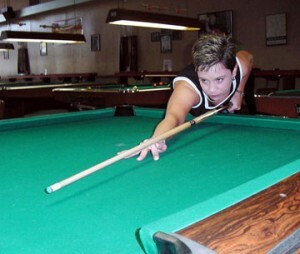 January 29th-30th weekend was the 1st Tour stop for the OB Cues Ladies Tour and 40 ladies were anxious to start the New Year with some high spirited competition, fun and as some players call it, OBCLT therapy. Rusty’s in Arlington, Texas was our host site for this weekend and it was indeed a welcome to have their fantastic staff and management host us once again. Special thanks to Jeff, Traci, Box, Sara and all the other Rusty’s staff and organization for a job well done. Many top ranked players from 2010 were part of the action this weekend. Some marquee names included Lisa Marr, Jennifer Kraber, Amanda Lampert, Tara Williams, Ashley Nandrasy and Orietta Strickland, to name a few. And by the end of play on Saturday, these marquee names were still in the running for the $750 guaranteed 1st place prize money, along with some new faces. Top 8 players continuing in the Main Event on Sunday were winner side matches featuring Amanda Lampert vs. Jennifer Kraber and Belinda Lee vs. Lisa Marr. On the one loss side, it was Ashley Nandrasy vs. Corina Campbell and Orietta Strickland vs. Tara Williams. Finishing 7th/8th was Corina and Tara. In 5th/6th it was Ashley and Orietta, and Jennifer with a nice 4th place finish. Great shooting, as always, ladies! In 3rd place, it was Belinda Lee. This was Belinda’s highest finish ever on the tour. Belinda defeated Lisa Marr to earn a spot to play for the hot seat against Amanda. But Amanda, as she has done so many times in the past, would not go down undefeated and earned her spot in the finals match. Then it was down to Lisa to avenge her earlier loss to Belinda, which she did to earn her spot in the finals as well. But we are sure that we will see Belinda with her strong playmaking skills and hammer-solid break in many future tour events. Excellent Tournament and fantastic finish, Belinda! The finals match between Amanda and Lisa was exciting as ever. As these two ladies have paired up in many previous OBCLT finals matches, this time was no surprise as many fans and spectators assumed before the start of the tournament, the eventual winner would be either one. In true double elimination format, Lisa would have to up-end Amanda twice and that is exactly what she did. Both sets were hill-hill matches. In the final set, Lisa, scoring her only break and run all weekend, did so for the final game to earn 1st place. Both Amanda and Lisa are true champions and have a great deal of respect for each other’s games; they are truly inspiring and fun to watch. Fantastic event ladies and congratulations to you both! In the second chance event on Sunday, 15 ladies participated in the $200 added event. In the end, Lisa Henderson-Major took first place honors against Kim Mills in the finals. Board member Julie Stephenson finished in 3rd.